After adopting Chinese & Tibetan Buddhist traditions, Master Chan Lien took retreat to study the Buddha’s teachings & various main Buddhist schools & meditated in graveyards. With excellent cultural & art literacy, she lectures around the world to several tens of thousands of disciples & students. Her lecturing includes: schools, prisons & various groups. Bhiksuni Chan Lien discusses the philosophy of life with teachers, students, prisoners & those of all walks of life. Bhiksuni Chan Lien actively participates in social work, assisting those with impaired vision, body, hearing & mentally challenged, even the elderly. 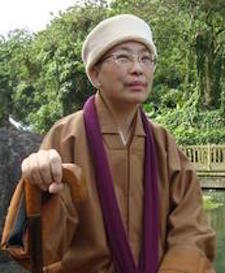 In addition to helping people cultivate compassion, kindness, knowledge, virtue & wisdom, she is enthusiastically concerned about public welfare & facilitates for the physically & mentally challenged to further advance their study & practice, so that they are able to realize the teachings of the Buddha in their daily lives. As a result, Master Chan Lien has gain excellent results & respect from the disabled & the social welfare groups, & is recognized as the “Mentor of the Blind,” the “Mentor of the Disabled,” and the “Mentor of Public Welfare.” In 2012, Bhiksuni Chan Lien was granted an Honorary Doctoral Degree in Education by the Korean International Culture University & was invited as to serve as the Honorary President of Nanjing Yida Education College. Precept Instructor for Precept Transmission, Karma Master, Ritual Guide of Bhikkhus & Bhikkhunis Ordination, Lay Persons Ordination & Eight Precepts. A Commentary on The Sutra on the Eight Realizations of the Great Beings, One Hundred Questions & Answers about The Sutra of The Great Vows of Kishitigarbha Bodhisattva, The Shocking Pores, Flying Red Dust, A Collection of Learning, The First Collection of Stopped Cloud, The Second Collection of Stopped Cloud, Astonishing Fly of the Mentor for the Blind, A Brief Discussion of the Sutra of the Great Vows of Kishitigarbha Bodhisattva, A Letter of Lotus Leaves, Dharma Talk of the Mentor for the Blind, Air Transmission of Truths, Trace of Mustard Seed, etc.